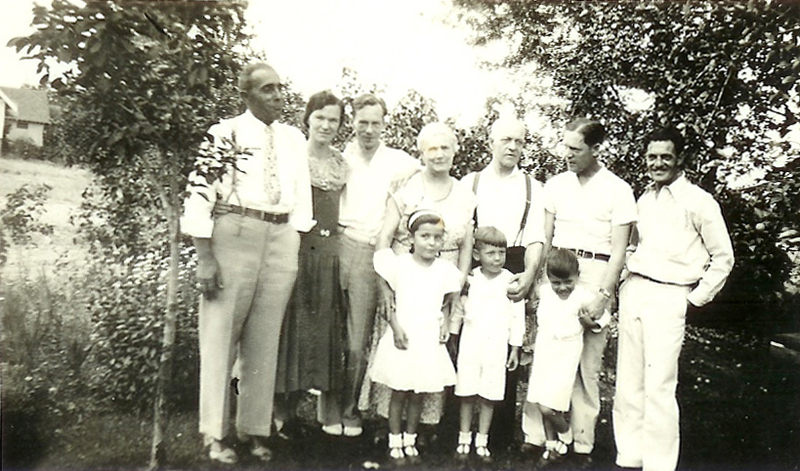 Costello & Young Family, left to right: John Costello, Mary Brown Young Costello, Andrew Brown Young, Catherine Brown Young, James Young, Alexander Brown Douglas Young, George Vickers Young. Children in front, left to right: Virginia Costello, Dan Costello, & Vince Costello. George Vickers Young is my great grand uncle. He is the younger brother of my great grandmother Mary Costello. When Mary was in a nursing home at the end of her life she would often lament to visitors that she wished she knew whatever happened to her brother George. Well Grandma Mary, do I have a story for you. Let’s start with the information from family records and my research. George Vickers Young was born 11 August 1906 in Carnwath, Lanark, Scotland. Shortly after George’s fourth birthday he set sail for America with his mother and siblings. They left 1 October 1910 from Glasgow, Scotland and sailed on the ship Hesperian bound for Montreal, Canada. They arrived in Quebec on 9 October 1910 and crossed the border into Vermont claiming their final destination to be Butte, Montana where they would join their husband and father James Young. James was living at 829 Placer Street in Butte. George and his family missed the 1910 Census in the US by 6 months. By 1920, George is living in Spokane, Washington with his parents and two of his brothers, he is 13 and his occupation is listed as none. The 1930 Census finds George still living in Spokane with his parents and one brother. He is single, 23 years old, and his occupation is that of bookkeeper for a wholesale grocery. George married Dorothy May Linstrum 7 July 1937 in Newport, Pend Oreille, Washington and again 19 June 1938 in Spokane, Washington. I don’t know if they divorced in between or just got married again. In 1939 they are listed in the Spokane City Directory at RD5, I’m guessing this means rural district?, his occupation is that of loader for Northwest Airlines. In 1940 their city directory listing gives an address of N1419 B Ave, RD5. His occupation is now Traffic Rep for Northwest Airlines. The 1940 Census has them at the same address. He is listed as a Clerk in the Traffic Department for Northwest Airlines. He worked 39 weeks that year and earned $1300. Dorothy was not working at the time of the census. She listed her education level as 5 years of college, he completed 3 years of high school. This is the last record I have for George and Dorothy together. On the 13th of September 1947 George married Eileen A. Norton in Helena, Montana. And then the trail stops. I found more records for Dorothy. She remarried in 1950. I tracked down a nephew who hadn’t known about George despite knowing Aunt Dorothy really well. He wasn’t able to help me but was very kind and found this secret marriage interesting. I asked my family members what they could remember about George. There are very few stories about George. Apparently he got himself into trouble a few times and was prone to drinking too much. His younger brother Andrew and his wife were at the lodge one evening when a page was read for Mrs. Young. Andrew’s wife went to the telephone only to see another woman there. It turned out to be George’s wife. I’m not sure which wife this was but that was the only meeting between the two sisters-in-law despite living in the same city. About two years ago I took all of this information and exhausted every resource I could think of to try and find George. When I couldn’t find anything else I decided to research Eileen. I traced her life forward and backward from her marriage to George. I created an outline and even found several newspaper advertisements for a business in Helena, Montana that she owned. I couldn’t find her death record so I checked the white pages. She was alive! Alive and 96 years old in a retirement home in Montana. I was very nervous to call her. She was listed in the white pages with her own phone number. But. I was worried that I might upset her. I didn’t know how her marriage to George ended. What if I would be bringing up painful memories. Or what if she was suffering from dementia or Alzheimer’s and couldn’t remember? In my shyness and worry I decided to call the main office instead. I explained who I was and that I was hoping Eileen could tell me what happened to my uncle George. I asked the office worker to contact Eileen’s family and give them my name and phone number. I was anxious for several days, hoping for a call. That call never came. Over time I mostly forgot about Eileen and would occasionally wonder if I should try calling again. But oh the shyness and worry. That shyness and worry kept me from calling. Last week several things nudged me and I decided I should try again. Eileen is still listed in the white pages and is 98 years old. I called the office again and explained who I am and what I hoped to learn. This time the man who answered happened to be the manager. He told me he knows Eileen really well. He said I could call her and ask her anything, that I wouldn’t be upsetting her and that her memory is pretty good for her age. I decided to call Eileen directly. I took several deep breaths, offered a prayer and dialed. No answer. The next day I tried again. Same nerves, same answering machine. A third day I called again. No answer. A short time later I tried again. No answer again! Seriously? The amount of nervous energy I had to overcome every time was making this VERY difficult for me. This time I left a message. I explained who I was and what I hoped she could tell me. I told her I would call again but she was welcome to call me as well. Monday morning I tried again. This time Eileen answered. Hooray! Our conversation began by making sure my George and her George were the same person. Once we were sure, she shared what she could remember about George and their life together. As you read my synopsis of our conversation you are going to think of lots of follow up questions. I did too. I asked them. She couldn’t remember more detail than what I share below. She couldn’t even remember how long they were married. Despite what she couldn’t remember she did recall some interesting and potentially helpful items. They met in Spokane. She was working for the government and staying in one of those hotels for working people and she met him there. George & Eileen married in Montana and then moved to Denver, Colorado. They owned a business there that was a type of confectionery drug store with a soda fountain. One day George got tired of it all and walked away. Eileen was left with quite a mess to clear up, bills, paperwork and the like. Once she had things settled, she left Denver and returned to Helena, Montana to her ice cream shop there. She filed for a divorce in Helena and was single for several years before she remarried Kenneth Blackmore. Eileen heard that George had some sort of a job in Denver after he left her and the business but she doesn’t recall what the job was. She could remember meeting George’s brother Sandy (Alexander), the only family member she met. She described Sandy as “fussy” and “fancy”. She said he worked in some sort of a Mens Shop and was very particular about his clothing. She said George was the same way. They always had very nice clothing and were fussy about what they wore and how they looked. They had no money but always looked nice, “they were working people, you know”. Eileen described George as a very friendly man who enjoyed people. She said they got along fine, real well and never fought. She said he never complained but she got the feeling that he never felt right and because of that didn’t want to work. She said he was very intelligent. She believed he was a pilot. He was in the service during WWII. After he returned home he worked for Northwest Airlines for a time. She said that he was part of the Masonic Lodge and was a Shriner. He thought the world of the Masonic Lodge. She knew he was married once before he married her but she didn’t know the name of George’s first wife or any details about their marriage. Eileen doesn’t know whatever happened to George. She asked me if he died. I told her I didn’t know but since he would be 108 if he were still alive, I figure he probably did die. She told me my math was right. 🙂 She doesn’t know if he stayed in Colorado. She never heard from him again after the divorce was final. She said he never had children. I am so glad I finally talked to Eileen! I don’t know why I get so nervous. She is a lovely woman. She told me to call her anytime. There was nothing to worry and stew about after all. I hope I can take these little facts about George and turn them into something helpful. I’m worried that he died alone, away from family and I may never find evidence of his death date and place. If I could talk to my great grandma Mary I wouldn’t be able to tell her the end of George’s story but I have a lot more of the middle. More than she ever knew. One day I hope to know George’s death date and place. But for now, I’m thankful to a 98 year old ex-wife who was willing to help me add more details to the story of George’s life. Thank you, Eileen, for the trip down memory lane! What an incredible story, thanks for sharing all the details. Good thing you listened to nudges. Thank you. Yes, I am quite glad that I did. I’ve been using the info she shared to look for additional info. I’ve found a few items after I completed this post that don’t perfectly jive with what she shared. This is definitely a work in progress. Glad you decided to call. I know what it is like to be nervous, you really do never know how people will react when you start asking them questions like that. So glad it worked out! I hope you do discover what became of George one day! I’m sure you’ve already found this but thought I would post it just in case! Source Citation: Number: 470-12-7744; Issue State: Minnesota; Issue Date: Before 1951. Yes exactly! Some people are so open and willing to talk about the past and others are not. I understand that not everyone has good feelings about their past so it makes me nervous approaching someone I don’t know. I don’t want to cause pain. Thank you for sharing that record! It looks like a distinct possibility doesn’t it? If I have found it before I don’t recall. I probably would have discarded it because I hadn’t known he was ever in Denver or Minnesota. Now that I know he served in some branch of the military the Minnesota thing could be somehow related to that and of course now I know he spent some time in Denver. I’m going to have to keep digging. Thank you for taking the time to look for this! I have found several city directory listings since I completed my post that don’t perfectly match what Eileen said, close just a bit off. Thank you again – you are fabulous! You’re welcome! Hope it all comes together! I completely understand your hesitation in contacting her. You never know what you’re going to drum up when you ask about the past! Exactly! The last thing I want to do is make a 98 year old woman cry or feel any kind of distress. I’m really glad it worked out so well. Yeah, it’s not shyness, so much as consideration, I’d say. It’s a fantastic story, genealogygirl. I find myself often drawn to the stories of the strong aunts and uncles, like your great Uncle George, who chose not to have families or chose not to get married at all—the ones that strayed from the path. They’re usually very interesting! Great idea, thank you Tina! And, thanks for stopping by.